When the moon hits your eye like a big pizza pie, that means you’re in Naples, Italy. Naples is Italy’s third largest city, and besides being known as the birthplace of pizza, it also has a not-so-nice reputation as being a place for organized crime. But aside from a shady taxi driver who charged us a phony flat rate fee when we arrived by night, I would say it is no more dangerous than any other big city. 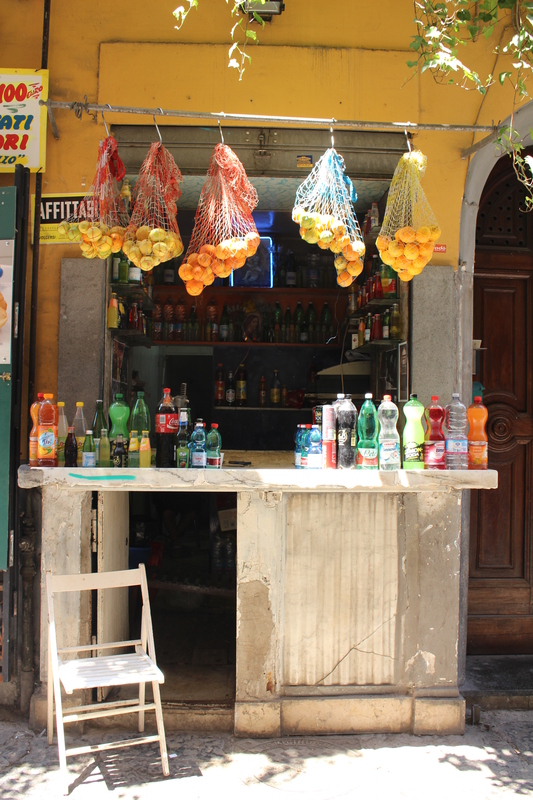 As long as you stay vigilant about your surroundings, Naples is perfectly harmless and wonderfully charming. 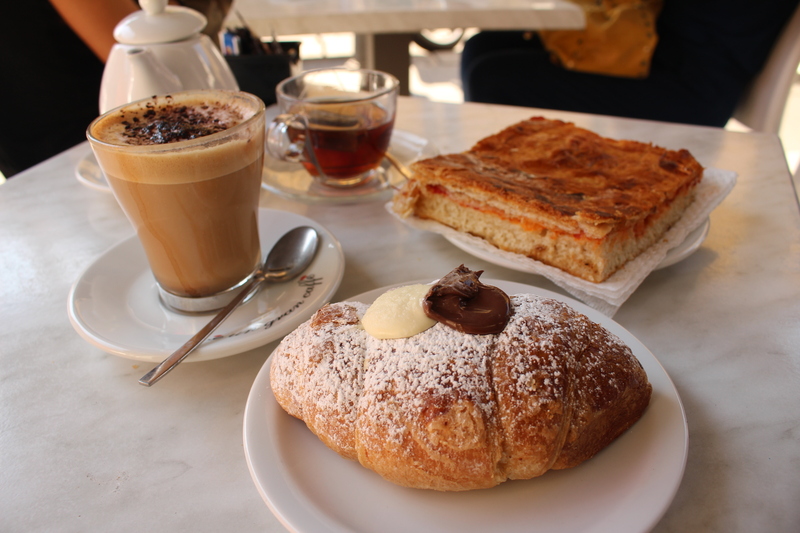 As a first timer in Italy, I imagined that we’d encounter all things quintessentially Italian. 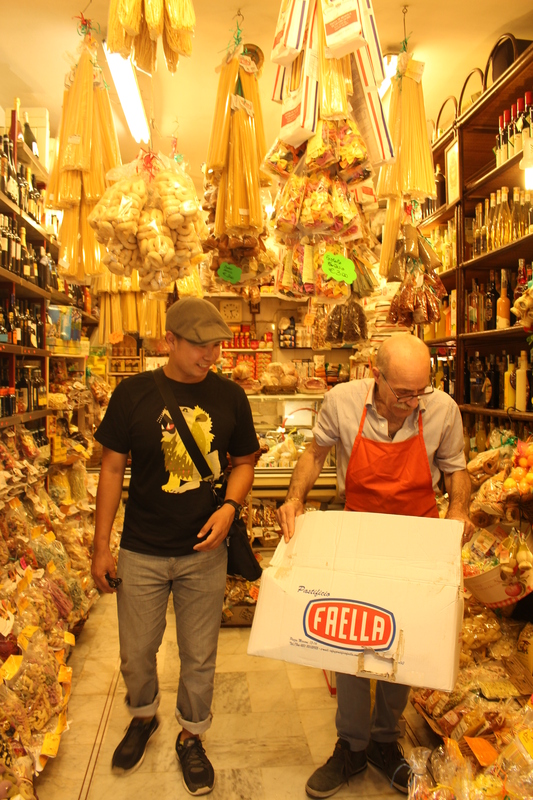 For starters, gelato, fresh pasta, Italian soda, hand tossed pizza – Naples offered more than just a taste of Italy in the literal sense. We hit up all the main sights as we explored the city as far as our feet could carry us. Simon and I window shopped down via Toledo, a historic street that now teems with storefronts and is a busy shopping boulevard. 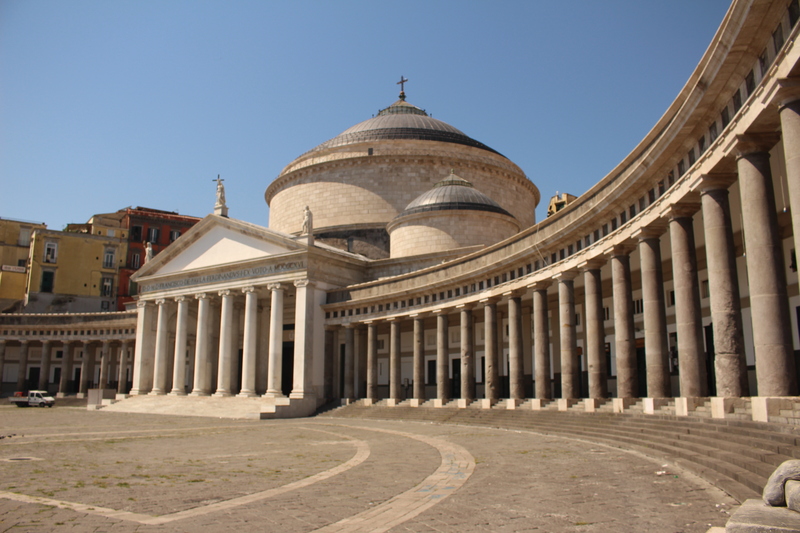 We were the only crazies that dared abandon the cool asylum of the buildings’ shade for some photo ops in the middle of Piazza del Plebiscito. The San Francesco di Paola, the church that borders the square, was surprisingly empty, allowing us to admire the place of worship and take a cat nap in the pews. We absconded away into the Teatro di San Carlo, just in time to join a short tour to learn about one of the oldest opera houses in the world. While I’m not a fan of opera, I was more than impressed by the gilded opulence and regal red interior, fit for royalty. 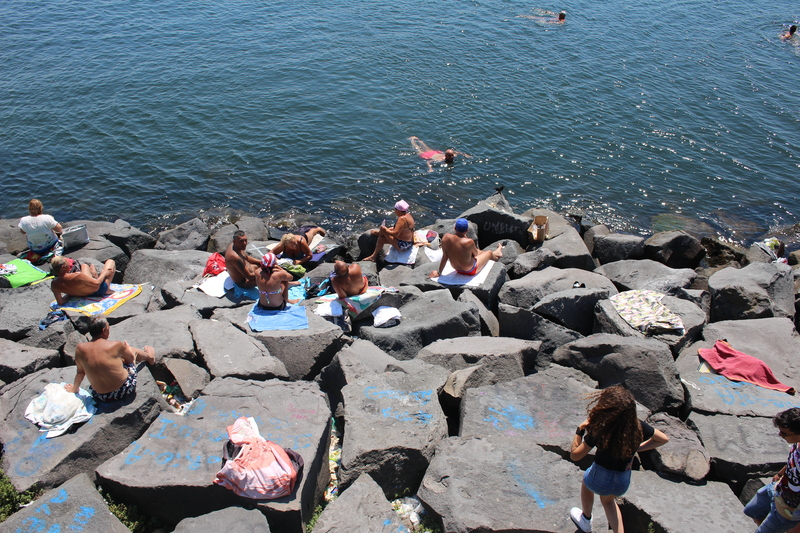 It’s always fun to observe locals in their element, and we found a spot to people watch at the waters’ edge. Tanned leathered bodies of all ages, shapes, and sizes donning swim caps enjoyed buoyant bobbing in the gentle waves of the glistening blue sea, while others dried off on brightly colored towels spread out on flat rocks. We passed by many alleyways with which I became obsessed. 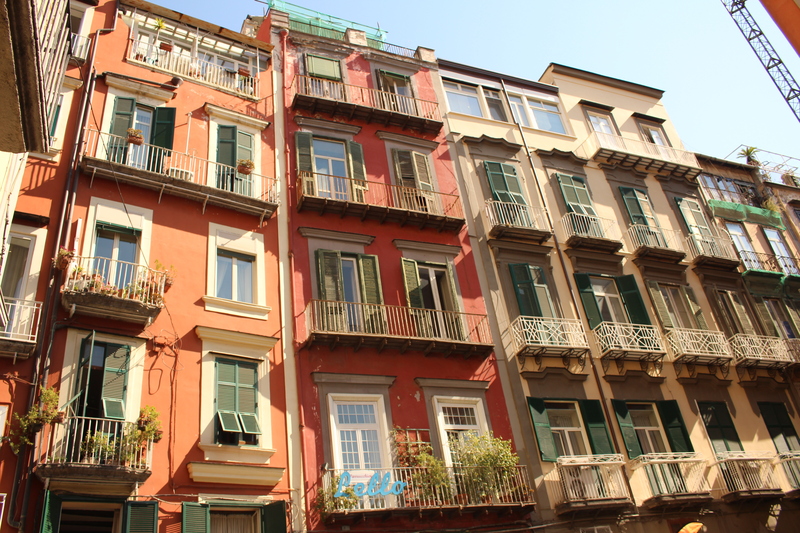 There’s something inexplicably charming about the buildings’ close proximity to each other – an intimate city planning coupling that seems right in line with the fact that Italians have a closer concept of personal space than us Americans. 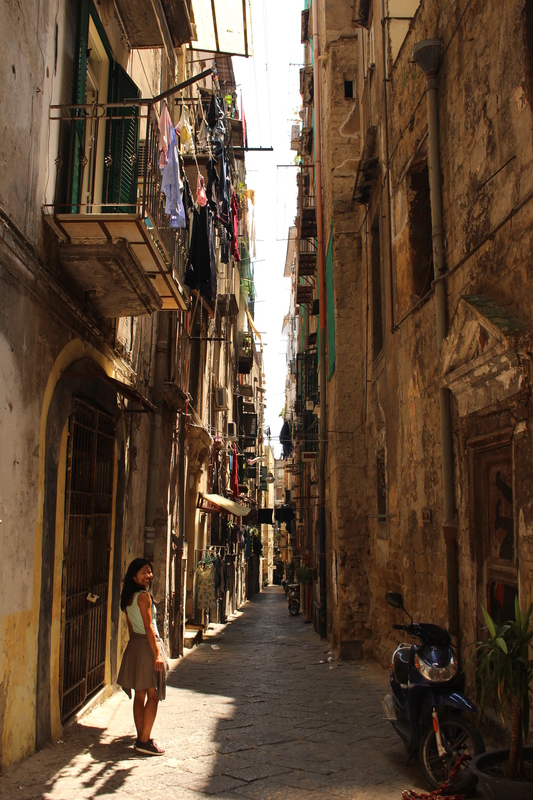 The quaint balconies, slightly ajar window shutters and faded pastel colors of the buildings were made even more romantic with the zig-zagging clotheslines of freshly laundered linens. It may be tough to decide where to empty your wallet and fill your appetite, but with so many cute cafes, ristorantes, and pizzerias at every corner, you can’t go wrong in the birthplace of pizza. At Sorbillos‘, Simon and I shared a classic Margherita pizza bigger than the both of our heads, oozing with gooey cheesy goodness that could hardly be contained by the immaculate thin crust. During our stroll after dinner, my ears perked up to a familiar song echoing through the streets. As we neared the source – a lone street performer playing by the steps of a church – I recognized what it was. When you hear the score to the Godfather playing in Italy, well, that’s amore. 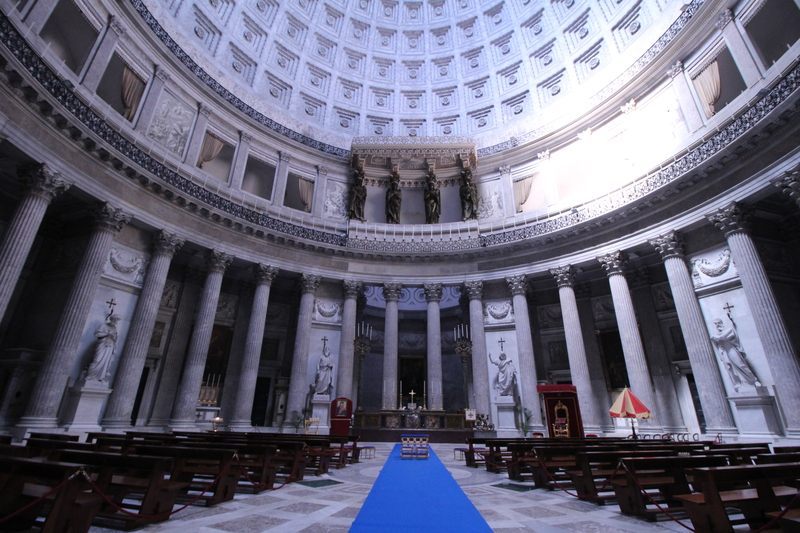 We were in Naples a few years ago but only used it as a hub for Pompeii and going to Capri. Now I see what we missed but we were with a group tour and didn’t have a choice. Bummer. Your photos are incredible! I am so envious of the pasta shops! Did you take any cooking classes while you were over there? Hi Lauren! Thank you! I’m glad you enjoyed my post. I wasn’t there for very long, so I didn’t take any cooking classes. But perhaps next time! Have you been there before? I have. I loved it! Italy is one of my favorite European countries. I ate my way through. 🙂 The pizza melts in your mouth! How long were you there?